The book was written by an international team of contributors and published by London-based Woodhead Publishing in October 2009. It serves as a guide to new developments for the dairy and nutraceutical industries, as well as researchers in those fields. Tomasula works at the ARS Eastern Regional Research Center (ERRC) in Wyndmoor, Pa., where scientists are developing strong, biodegradable dairy-based films that are better oxygen barriers than petrochemical-based films. Tomasula leads the center’s Dairy Processing and Products Research Unit. 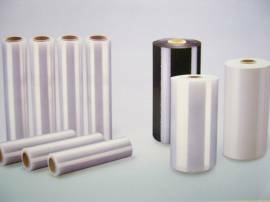 Most food packages are made of multilayer films that are thin, continuous sheets of synthetic polymers. But consumers and food retailers are concerned about the waste generated during the manufacture of such packaging. Many, it seems, are interested in replacing petroleum-based packaging with biobased packaging. Tomasula’s chapter in the new book is titled “Using Dairy Ingredients to Produce Edible Films and Biodegradable Packaging Materials.” The chapter focuses on films made from dairy proteins, with an emphasis on those based on casein and whey, the major proteins found in milk. It also covers research efforts to improve the proteins’ mechanical and barrier properties so that these natural materials eventually could be used in a variety of future applications. As a dairy ingredient, casein shows good adhesion to different substrates. But while casein is an excellent barrier to oxygen, carbon dioxide, and aromas, it is a weak barrier to moisture. Because the water-soluble nature of those proteins poses a challenge, much of the research on edible casein films to date is directed toward improving their water-vapor-barrier properties. More information on the book can be found at www.woodheadpublishing.com. ARS is the principal intramural scientific research agency of the U.S. Department of Agriculture.